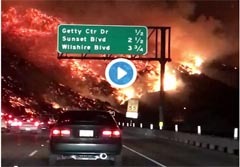 Highway to Hell ... oder, auf dem Weg zur Arbeit Ein Rekord, der Angst macht: Das sogenannte Thomas-Feuer nahe Santa Barbara und Ventura dürfte zum größten kalifornischen Busch- und Waldbrand werden. Es habe mehr als 1100 Quadratkilometer niedergebrannt und mehr als 1.000 Gebäude zerstört - und es fehlten nur noch vier weitere Quadratkilometer zum absoluten Rekord, so die zuständigen Behörden. Zum Vergleich: Das Bundesland Berlin hat eine Fläche von 891 Quadratkilometern. Seit dem Ausbruch des Feuers am 4. Dezember in den Bergen nahe dem Ort Santa Paula starben zwei Menschen, zuletzt ein Feuerwehrmann. Die Flammen hatten sich wegen der herrschenden extremen Trockenheit und der starken Santa-Ana-Winde schnell ausbreiten können. Trotz des Einsatzes von über 1.000 Feuerwehrleuten konnten die Brände in den letzten 3 Wochen nicht gelöscht werden. Rund 250.000 Menschen mussten evakuiert werden. Heftige Winde mit Geschwindigkeiten von bis zu 80 Stundenkilometern fachen die Flammen immer wieder an. Die Stadt Ventura im Süden Kaliforniens ist besonders bedroht und die Aussichten, die Flammen schnell unter Kontrolle zu bekommen, stehen laut der örtlichen Feuerwehr nicht gut. Die Stadt am Pazifischen Ozean hat rund 100.000 Einwohner. Letzte Woche wies die Feuerwehr mehr als 27.000 Menschen an, ihre Häuser zu verlassen. Kaliforniens Gouverneur Jerry Brown rief den Notstand aus. Begünstigt durch staubtrockenes Buschland fressen sich die Flammen immer weiter voran und rücken an die Millionenmetropole Los Angeles heran. Der Bürgermeister von Los Angeles, Eric Garcetti, hat die Bevölkerung zur Vorsicht gerufen, weil durch Funkenflug jederzeit neue Brände aufflammen können. Inzwischen sind auch die ersten Promis betroffen, der Nobelstadtteil Bel Air hat die ersten Häuser an die Flammen verloren. Lionel Richie hat bereits Konzerte abgesagt, Rupert Murdoch, Beyoncé und vielen mehr droht der Verlust ihrer Anwesen. 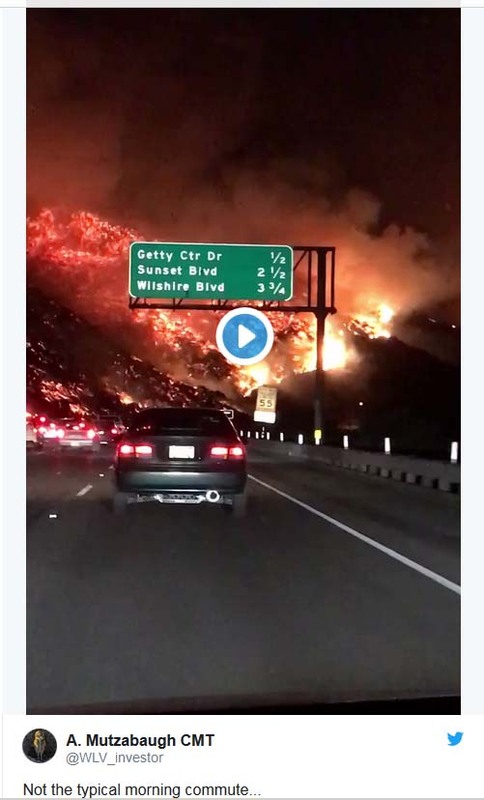 Kalifornien war dieses Jahr bereits von verheerenden Bränden heimgesucht worden. Im Oktober kamen bei Flächenbränden in den weiter nördlich gelegenen Weinanbaugebieten mehr als 40 Menschen ums Leben. Mehr und mehr Studien bereiten die Bevölkerung Kaliforniens darauf vor, dass es in den nächsten Jahren nicht besser werden wird, denn der Klimawandel wird auch künftig für trockene und heiße Jahre sorgen (zeit.de: Flammende Teufelswinde in der Regenzeit). Southern California’s largest fire .. When the firestorm ravaging southern California came to the idyllic mountain farmland of the upper Ojai valley, 90 minutes’ drive northwest of Los Angeles, Deon de Wet thought he was ready. He had thick firemen’s hoses with brass nozzles set up around his property, a farmhouse which doubles as a yoga studio and healing centre. He was dressed in a thick coat and winter muffler which he doused with water so he could withstand intense heat, if necessary, to defend the home that he and his wife have enjoyed for the past nine years. From his vantage point, he could look down to where the fire had started, in the hills above the valley town of Santa Paula, and trace the progress of its sinister orange glow as fierce winds caused it to whip up and down canyons and draw ever closer. But de Wet was not ready, not for this. A transformer exploded in the hills, sending power lines crashing into the mountain chaparral and creating a whole new front of flames and heat. With the winds now reaching 80mph, his neighborhood was engulfed at dizzying speed. Soon burning embers had flown on to his guest house and set it alight. No sooner had he put out that fire than an oak tree directly above his donkeys and horses lit up. De Wet and his neighbors were lucky to have a fire truck on hand, but there were too many emergencies breaking out and nowhere near enough resources to respond to all of them. By the time the night was over, de Wet’s house was gone, and so was a carport where he kept his motorbikes and one of his cars. His turtles boiled in their turtle pond, and roughly half of his dogs, cats, chickens and ducks perished. In a week of hell across some of southern California’s most beautiful and treasured landscapes, de Wet’s story has been echoed hundreds of times. On the night he lost his house, the flames roared down the canyons to the oceanside city of Ventura, burning hundreds of homes and coming close to destroying the heart of the city. By the next day, three fires had erupted in Los Angeles, including one that threatened Rupert Murdoch’s hillside vineyards in the super-rich enclave of Bel Air. A subsequent fire broke out near the camp pendelton marine corps base north of San Diego. With no let-up in the desert winds that were fanning the flames, the fires were, as of Friday, edging up the coast towards Santa Barbara. Like the fires that ravaged Santa Rosa and other parts of northern Californiain October, these have been fast, ferocious and more threatening to populated areas than any fire in memory. “I’ve been here since the 1980s and this is the worst I’ve ever lived through,” said Timothy Teague, a photographer who lives in Ojai. Although personally untouched by the fires, he learned over the course of the week that the avocado and citrus farm where he grew up in Santa Paula had been leveled, that a house in the hills belonging to his sister’s son was gone, and that a cousin living on the beach north of Ventura had watched the palm trees across the street explode and narrowly escaped losing her home, too. Fire season rarely stretches so far into the winter months, but southern California has endured drought for five of the past six years and has been without significant rain since last spring. The dry winds that blow in from the Mojave desert are also unusual in December, and rarely last more than a couple of days. This time, they are forecast to blow for a week or more. On top of that, many of the affected areas have had a dangerous build-up of brush – in Ojai’s case, since the last major fire in 1985. Heavy use of groundwater by farmers has separated many tree roots from reliable sources of moisture, which not only causes the trees to burn more fiercely but created underground rivers of heat and flame that have contributed to the fires’ terrifying speed. The first fire broke out near St Thomas Aquinas college above Santa Paula at dinner time on Monday night. Within three hours, it had spread not only to Ojai but across several canyons to downtown Ventura, where it took the local population almost completely by surprise. Trinity Wheeler, a portrait photographer, knew something was wrong because she was working late at her downtown studio when the power went out. The next thing she noticed was the gale-force wind and ash in the air. Then she looked up at the sky. The town was eerily quiet, but in the hills above fire was pouring down like a river. Wheeler and her husband began calling friends and banging on people’s doors. In the apparent absence of an early warning system – something local politicians are now saying demands an urgent explanation – neighbors roused each other and began fleeing. Eventually, the police toured the most endangered streets and barked warnings through the megaphones on their cruisers. “We were given less than 10 minutes to get out,” recalled Cherie Eulau, a high school history teacher. By the time she and her husband left, their garage was in flames and the fire truck that raced to their street had to leave again to pick up extra water because the fire hydrants weren’t working. By the early hours of Tuesday morning, the Ventura fire department was fighting to save the town. Residents scattered – to the beach, to neighboring towns – and looked back at the familiar hills now turned a solid red and orange. A botanical garden directly above city hall burned to a crisp. As day broke, Ventura was over the worst, but in Ojai the nightmare was continuing. The fires moved steadily westwards toward the main Ojai valley – an area of idyllic beauty and pink-tinged sunsets that has long captured the imagination of spiritualists, tourists and Hollywood film-makers – and the town center with its clock tower and arcaded main street. Meditation Mount, a local beauty spot with a view across the valley, erupted in flames mid-morning. Nearby, a Scottish-born environmentalist named David White defended his property as best he could, turning on the sprinklers in his fruit orchards and hoping for the best. His house survived. A few ridges over, Connor Jones watched the fire rage ever closer to his property. A reservoir he dug a few years ago was too empty to be much use, so he rushed to his parent’s house nearby and set up a pump to empty their swimming pool instead. From Tuesday into Thursday, he watched the ridge directly above his property burn. Every time he saw a spot fire break out on his side of the ridge, he raced over with hand tools to turn over the soil and stamp out the flames. The rubber on the soles of his boots was soon half-melted. Wednesday night saw something of a reprieve for Ojai, as the winds dipped and, unexpectedly, moved off in a different direction. As many as 1,000 fire fighters from all over California and Oregon spent much of that night in the hills defending the town. By Friday, the region was in the midst of an uneasy lull. Miraculously, just one death was reported – of a woman who drove her car off the road as she was fleeing her canyon home near Santa Paula. Many towns, though, continued to be choked in thick smoke, and even residents who returned to their homes were acutely aware that a change in wind direction over the weekend could place them in danger anew. They also wasted no time worrying about the fires of the future and the likely effects of global warming on the sensitive environment of coastal California. Environmentalists like White and Jones pointed to structures that survived the fire – including some experimental modified adobe structures in the hills above Ojai – and said California would have to rethink its building codes and approved materials.